The Reduced Silver series are suitable for applications where infrequent switching is specified. In such applications the degradation of the tip is minimal and therefore a higher volume of silver is unnecessary. 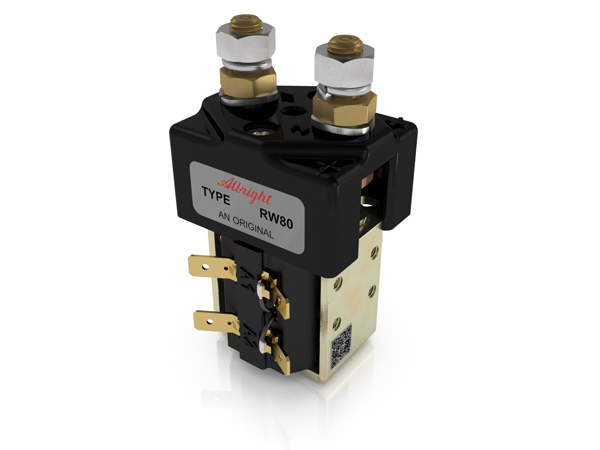 Developed for Uninterrupted current applications the RW80 is typically used in line contactors and Power Distribution Systems. The RW80 features single pole double breaking main contacts with silver alloy tips, which are weld resistant, hard wearing and have excellent conductivity. The RW80 has M8 stud main terminals and 6.3mm spade coil connections. Mounting is via M4 tapped holes or mounting brackets, either supplied fitted, or as separate items. Mounting can be horizontal or vertical, when vertical the M8 contact studs should point upwards. If the requirement is for downwards orientation we can adjust the contactor to compensate for this. Blowouts 800A at 80V D.C.
Blowouts 190A at 96V D.C.
No Blowouts 190A at 60V D.C.